Whether you enjoy the water or just want to soak in the sun, a day relaxing on the beautiful white beaches of Saint Kitts is the perfect way to spend your time on the idyllic Caribbean island. Took a taxi to South Friar Beach to Carambola Beach Resort. Took a taxi to South Friar Beach to Carambola Beach Resort. Nice beach with chairs and umbrellas to rent. With showers and bathrooms. Very clean. Was a fine trip. Kind of short and felt a little like cattle being herded myself but my husband wasn&apos;t bothered. The beach was mediocre at best. Took a cab from shopping area from tour company to Shipwreck Bar and grill at South Frias Bay beach. Steel band on a catamaran to a beach. Was taken to a lovely beach for a couple of hours. 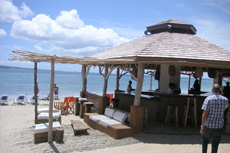 Rum and Reggae tour, open air tram to and from the beach. Rum and Reggae tour, open air tram to and from the beach. Wonderful local guide: Vernon Beto, was very informative and fun. Three adult beverages included, mix and match beer rum or soda. a nice drive to Cockelshell beach. When we got to the beach there were no available lounges..
Nice drive and coastline. Beach was nice with chairs ($10 for an umbrella) but didn&apos;t need one as there were trees to give us some shade at the Spice Mill beach (Cockleshell Bay). Nice view of Nevis island nearby also. We booked only one shore excursion which was in St Kitts. Our belongings were taken by the Umbrella Man to incite payment for the umbrella we used. Our belongings were taken by the Umbrella Man to incite payment for the umbrella we used. Panhandlers won&apos;t leave you alone. Cockel Shell beach chairs were nice, beach had a huge drop off when you entered the ocean and made getting out of the water very difficult. Taxi dropped the four of us off (the rest of the people went back to the port) and we spent a few hours at Friar&apos;s Bay. It was a bit crowded, but LOVELY water, clean beach. Lots to do (water toys up the ying yang!). Went to to island of nevis and got lunch and tour and beach break. Went to to island of nevis and got lunch and tour and beach break. Beach is very rocky need water shoes. Private again, with private Taxi, all around same pricing for taxis... Cockeshell, and wonderful time , in the water with beer the whole time, standing and talking with people..turned out to be a big party! We went to a private beach that allowed us to enjoy the clear warm water. Beautiful shuttle ride, amazing beach, and a relaxing beautiful few hours in the beach. The drive to the beach, which was on the other side of the island, was very scenic.